Discussion in 'Wrestling' started by Ocy Docy, Feb 9, 2019. Does anyone have an idea of who might wrestle in the Open? All our starters? It's only a week away and there seems to be no buzz. I am just guessing. But maybe fringe qualifiers or out. (157,165, 285). Guys that could reach 70% win percentage. Not sure if backups or unattached guys will wrestle. I could see a lot of Forfeiting out after reaching certain qualifying criteria. If I understood Dresser correctly prior to the last dual in Johnnys all non starters and redshirts would wrestle along with some starters. But not many starters. Any idea what teams will send guys? UNI has it on their schedule. I see that it has moved to Lied recreation center from Hilton. I am surprised that this isn’t limited to D1 teams. Nice thing about being the host... I'm sure we can arrange the bracketing so that our guys who need D1 matches are able to get them. I propose all of our guys that are just shy of 0.700 be put in appropriately sized round robin brackets with only true freshmen walk ons that are wrestling up a weight class. Just prior to that, he mentions that Connor Brown at 125 has taken a leave from the program. How about a little explanation of the purpose of this event? I recognize that it has something to do with qualifying for the post-season. But what is the .700 about? And why would someone forfeit after reaching a "certain qualifying level" as I read in another post? I understand how track has qualifying times and last weekend was one of the last opportunities for athletes to achieve them, but I don't understand how this wrestling meet helps someone qualify for the postseason, particularly in a sport where rankings are based on votes and perception, not times and wins. Please help. Hard to explain succinctly, but see if this helps. I think it has to do with reaching certain criteria for allocation legs. There is also a certain number of matches that are needed to get a coaches ranking. To get an almost guaranteed allocation, you need to reach 2 of the 3 legs. Guys might forfeit out, if they reach the 70% level and don't want to chance a loss that would drop them back below it. Also if they are facing non D1 guys, that does nothing to help allocations. I assume most of these guys have dealt with an injury at some point in the season that has limited their matches. So they may not want to risk a late season injury. Isley at 285 of UNI probably needs matches and is probably not in right now. Could see Iowa bringing some guys. Costello at 285, Shaw at 174, Turk at 141. None of these have 17 matches and would be good opportunity if their starter get injured. Based on the teams participating and the comments from various coaches I think that "Last Chance" refers to it being the last chance for backups and redshirts to wrestle as the season draws to a close for anyone that isn't a starter. 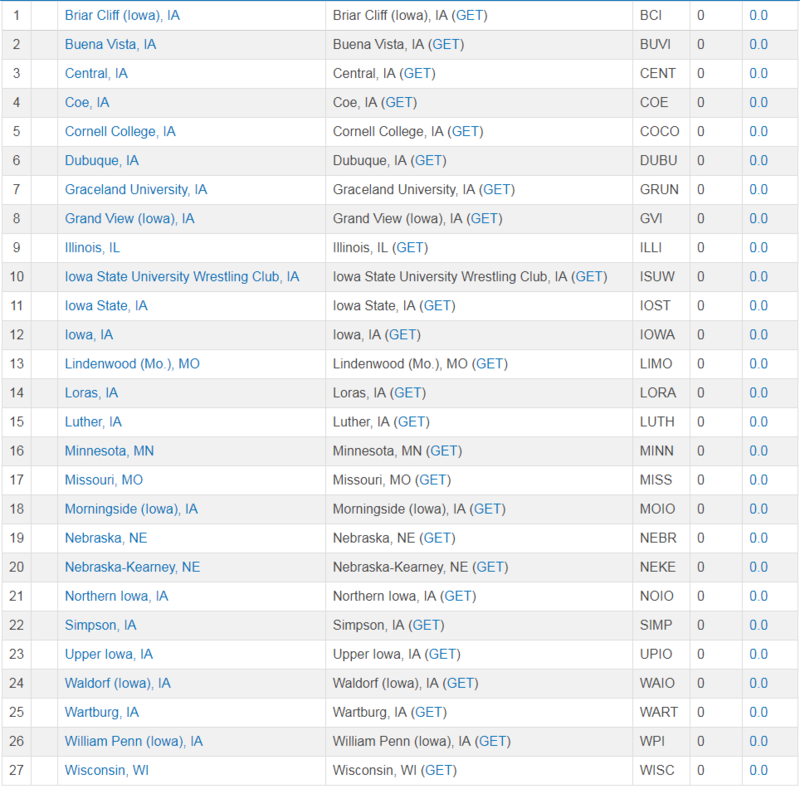 The timing also probably is nice for recruiting since it's right up the road from Des Moines on a day a whole lot of wrestlers and coaches are heading home from Des Moines after the State tournament is finished. But it's got a double meaning because it is also the "last chance" for starters to either get extra matches for the 17 match minimum for an RPI to be calculated or to try to pick up a couple of wins to improve their win percentage, since those are two of the three legs needed to earn an NCAA qualification. So if I guy is right at the margins they might show up, get the match or two they need to reach 17 or to get above 0.700, and then default out. Right now we don't have any starters that need matches for an RPI - Miklus is two shy but we have 2 duals left, and Schumacher only has 7 matches at 165 so going wouldn't help him. I thought it was JARRETT JACQUES who beat David Carr?